Old Win32 apps do not use modern APIs and therefore they do not need any app capabilities declared. They will continue to work without any issue without having any app capabilities declared within the package. It is very likely you all have come across at least one application which requires auto-elevation on launch. And to put some more clarity on those who are not so familiar with this concept, this is nothing else than User Account Control window which you have seen in earlier versions of Windows too. 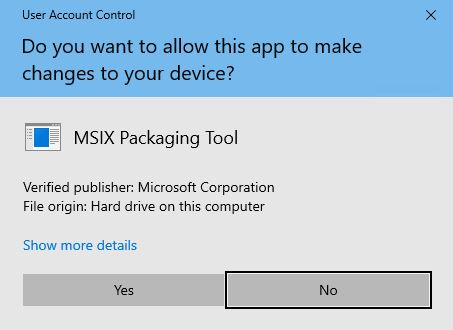 Below it’s a screenshot of UAC Window which we get if you launch MSIX Packaging Tool shortcut. As this is a Microsoft developed tool used by IT Pros to create and edit MSIX packages, it is easily understandable why auto-elevation is required on launch for this specific application. As I said at the beginning, all these capabilities can be found in the "Capabilities" section within the manifest file. Though, if you plan to submit your application to Microsoft Store, please be aware that it is very unlikely to be approved if you declared allowElevation capability in your application. If your application does not have this value in its EXE manifest then the “allowElevation” capability will simply be ignored and the application will not try to elevate automatically when the user launches it. The user can still manually run it as an admin, if he has the credentials. When it comes to app capabilities, Advanced Installer comes with its own way to define these easily within Advanced Installer’s interface, by selecting them from a predefined list. All you need to do is to go to “Capabilities” page and once in there, you will be presented with the full predefined list of capabilities which can be easily managed. 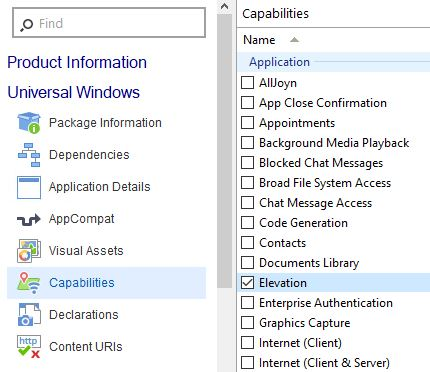 Just by enabling “Elevation” option (see screenshot below), you can allow your package to preserve existing desktop functionality that requires auto-elevation on launch and/or during application’s lifetime. Are you keen to find out what other capabilities you could define within Advanced Installer’s GUI along with a short description about each of them? Please have a look here.